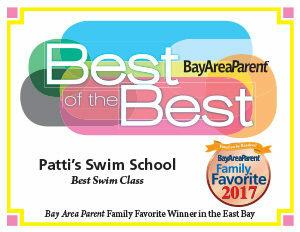 At Patti’s Swim School we are committed to providing an environment where our students feel safe enough to try new things, have fun, and learn in a unique residential setting where parents, grand parents, family and friends can observe lessons and celebrate the new skills gained by our students. Patti’s swim school supports and encourages parent involvement with their student’s learning process. Management and the student’s instructor are always available to provide feedback and answer any questions about their students’ progress. To provide an optimal learning environment, lessons take place in a saline pool. This provides our students and our instructors a healthier environment in which to learn and allows instruction to take place without the use of goggles. Studies suggest that regular exposure to highly chlorinated pools can pose long term eye problems and other health risks. Our pool is kept in the low 90’s for the comfort of students and instructors. We are outdoor May through October and indoor during the winter months. 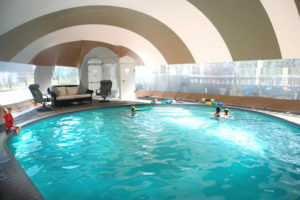 Day and Evening Hours Are Available for Swim Sessions. Thank you for your interest. For questions or comments, feel free to call us or use this form. We look forward to hearing from you soon.